Newly published poems can be found here and Martyn’s most recent poetry collection is The Lovely Disciplines (Seren Books, 2017). A crown or sequence of 14 linked sonnets, called O. at the Edge of the Gorge, with art and design by Phyllida Bluemel, is published by Guillemot Press (2017). Martyn’s First World War abecedary sequence, A Convoy, is published by If a Leaf Falls Press (run by Sam Riviere) in 2017 in a very limited edition. And Up-coming Events . . .
Monday September 10th: Martyn will be talking about translating Federico Garcia Lorca’s poems with Hilary Davies and Michael Glover – a real soiree with music and related art work @ Omnibus Arts Centre, 1 Clapham Common North Side, London SW4 0QW. £10/£8 concs. Tuesday October 2nd: Martyn will be the headline reader at Beyond Words, @ The Gypsy Hill Tavern, London SE19 1QH. 7.30pm £4/£3 concs. Tuesday 15th January 2019: Martyn will be one of several translators reading at the Lumen Church – with George Szirtes, Elaine Feinstein, Tim Ades and more @ 88 Tavistock Place, Kings Cross, London WC1H 9RS. Tuesday June 18th 2019: Martyn will be one of two guest readers (with Hilary Davies) at the Lumen Church @ 88 Tavistock Place, Kings Cross, London WC1H 9RS. 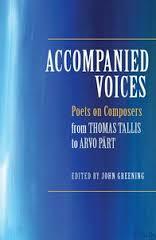 Martyn has two poems in response to listening to music in the anthology Accompanied Voices: Poets on Composers – From Thomas Tallis to Arvo Part, edited by John Greening. Published by Boydell and Brewer: Click Here.